If you’re in Los Vegas there’ll be so much going on you’ll probably think of skipping visiting Downtown. Well, don’t. Downtown is where the whole concept of Las Vegas was born and it’s more than just the historic center of what is affectionately known as Sin City. There’s so much going on in DTLV, more even than on the main Las Vegas Strip, you won’t have time to sleep. Downtown Las Vegas is the most exciting part of town. Let’s face it, where else in the US can you fly over a city street on a zip line? Downtown Vegas is something else. Apart from casinos galore, there are shopping malls constructed from shipping containers, museums with very unusual exhibitions and fantastic entertainment centers. The nights in DTLV are lively and illuminated by a blaze of neon lights so bright; you’ll need to wear shades to stop yourself from squinting at the glare. Be prepared to be surprised by what you find in DTLV, but whatever you do, don’t miss these fifteen best things to do while in Downtown Las Vegas. They’re Sin City musts. Vegas Vic is the iconic neon sign of Downtown Las Vegas. See the cowboy’s cheerful visage peering down at you and you know for a fact you’re in DTLV. 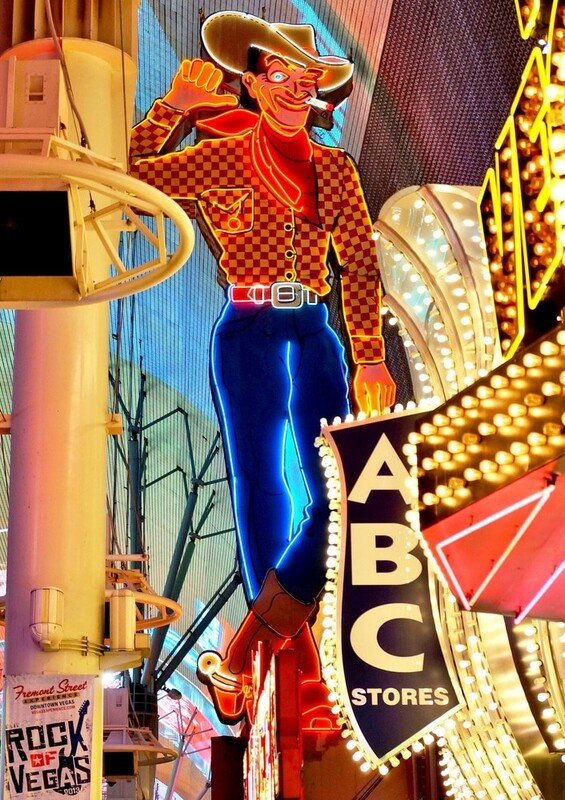 The sign was erected in 1951 and was capable of waving at visitors to Fremont Street as well as broadcasting the welcome message, “Howdy partner” at fifteen-minute intervals. The smiling, winking figure is forty feet tall and is lit twenty-four hours a day. While Vegas Vic may no longer wave or talk, he makes a great souvenir photo and even if you don’t win a million in the casino, he’s proof you’ve been in Downtown Las Vegas. If watching the roulette wheel spin doesn’t get your adrenaline flowing, the Slotzilla Zip Line will. 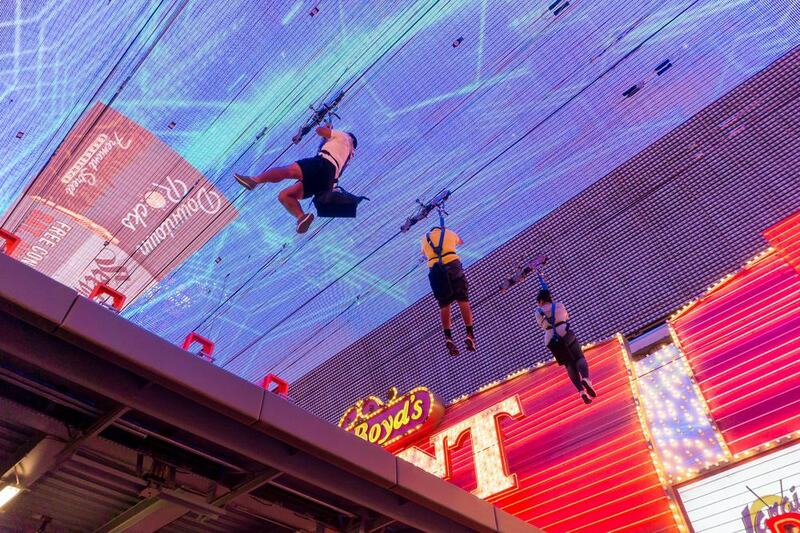 The zip line runs for over a third of a mile beneath the canopied ceiling of the entertainment center the Fremont Street Experience. Launch from the twelve-story high slot machine, Slotzilla, and whiz over the ant-sized heads of the pedestrians below. Choose between flying one hundred and fourteen feet up in a prone position or if that’s just too scary, go for the seated ride at seventy-seven feet. They’re both awesome. Visit the Old Las Vegas Mormon Fort to discover what DTLA was like before neon and electricity were invented. The inner city state park contains the very first living structure constructed in Las Vegas and dates back to around the mid-1880’s. 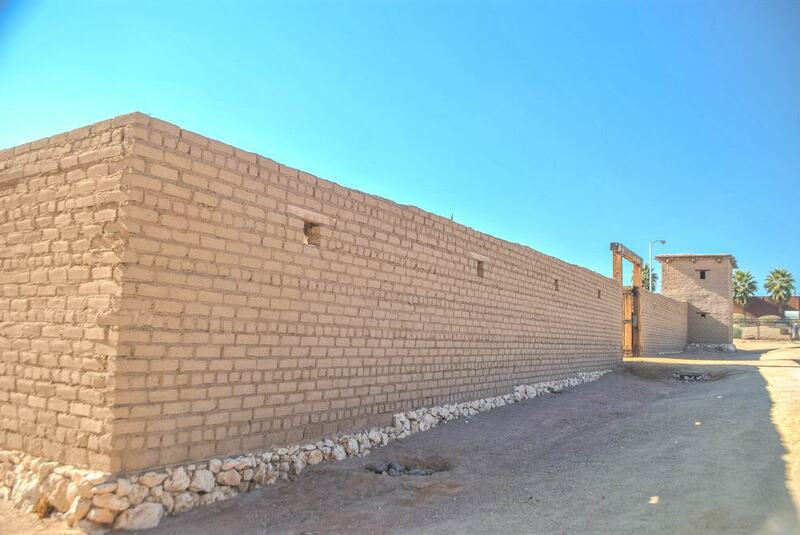 The fort which covers over three acres was built by Mormon settlers as protection from Indian attacks fifty years before Las Vegas was founded. Inside the fort’s adobe walls, there are living quarters, authentic wagons, livestock barricades, and lots more interesting artifacts. The fort is an intriguing example of how much life has advanced in the past one hundred or so years. There’s a saying which goes – only in Downtown Las Vegas. The Heart Attack Grill fits that perfectly. If you like to dress up for dinner, you’ll love slipping into one of the Grill’s hospital gowns or doctor’s outfits before you chow down on burgers with the highest calorie count you could imagine. These burgers are extreme. 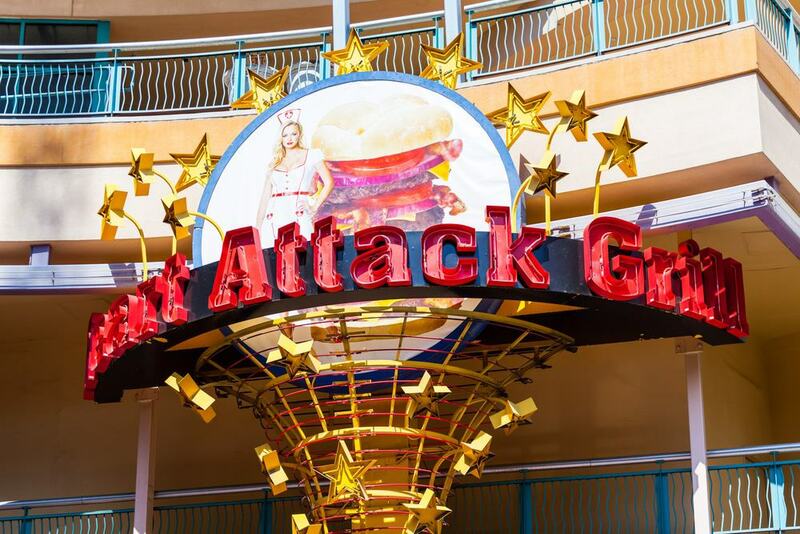 The Heart Attack Grill is just as much about fun as it is about food. Sip a drink through an IV line to help wash down the contents of the Bypass Burger of your choice. A single, double or even triple Bypass are manageable. Pick the Octuple Bypass Burger, and you could be in trouble unless you can woof down eight burger patties topped with forty slices of bacon and enough cheese to take it to a calorie count of almost twenty thousand. If you can’t eat it, don’t order it. There’s no sharing allowed and if you don’t finish be prepared to get a spanking. The Downtown Las Vegas Events Center, or DLVEC for short, is a mega, open-air events venue which has the space to accommodate up to eleven thousand people. The center hosts everything from three-day festivals to heavy rock concerts. The DLVEC also operates a Downtown Watch Zone for major sporting events. Reserve a table on the inner field on big game days and watch the match action on the ginormous screen surrounded by other spectators. The atmosphere is electric. For intimate spectating, the DLVEC offers “man-caves” large enough for twenty with sofas, TV screens and a beer pong table. Get spooked silly at the TV star’s Haunted Museum. Housed in what is reputedly a haunted building, the museum covers eleven thousand square creepy feet. The nineteen thirties mansion is full of dark corridors which lead to the rooms full of exhibits connected to the paranormal. 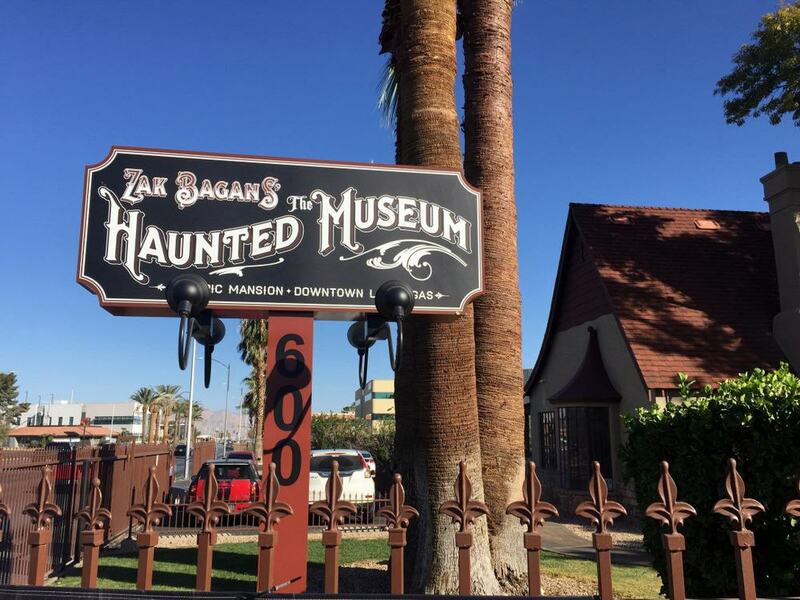 The Haunted Museum has some very well-known oddities on display including the Dybbuk Box, a wine box supposedly possessed by a malicious spirit, and the staircase from the Demon House in Indiana. Don’t miss the Puppet Room – now that is seriously freaky. 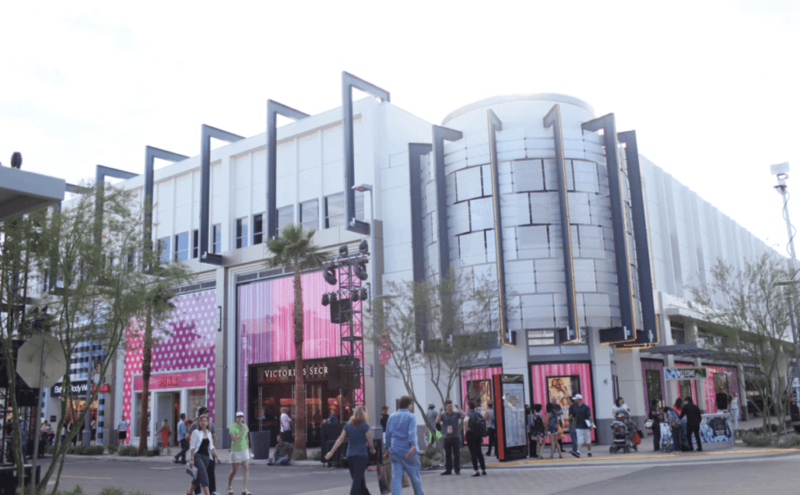 There are shopping malls then are are shopping malls like Container Park which are completely unique. Is the weirdest thing about it the fact the mall is constructed from old shipping containers or is the giant metal sculpture of a praying mantis at the entrance stranger? It has to be the mantis which shoots jets of fire from its antennae at night. 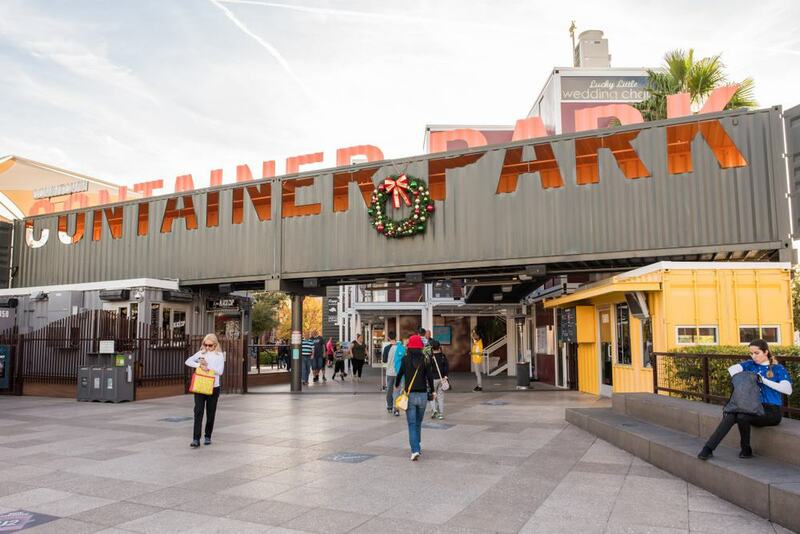 At the open-air Container Park, there are retail outlets stocking clothes, watches, chocolates, special gifts for the Vegas gambler and in case you feel the urge to suddenly tie the knot, a wedding chapel. Grab a hot dog with an unusual topping, indulge in a decadent Waffelato or pop into the Dome for a 4K-visual interactive game. The Container Park is a fun place to shop. 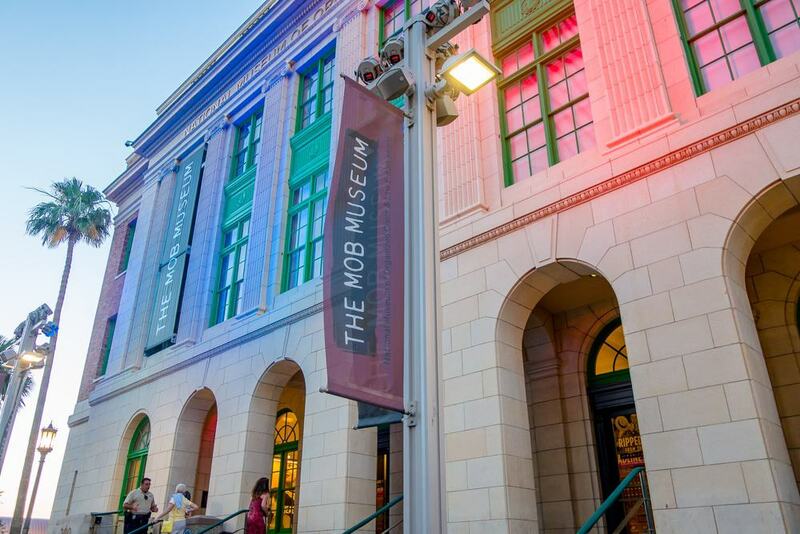 Discover the seedy secrets of the underworld of organized crime at the Mob Museum in DTLV. Housed in what was historically the Las Vegas post office and courtroom, the museum offers an insight into the life and times when the mob ruled the town. The museum exhibits date back to the time of prohibition with photos and biographies of the heavyweight gangsters on display. Learn how law enforcement fought back in the interactive forensic laboratory. Don’t miss the courtroom where real mob members were tried for their crimes and take a seat in the electric chair if you dare. 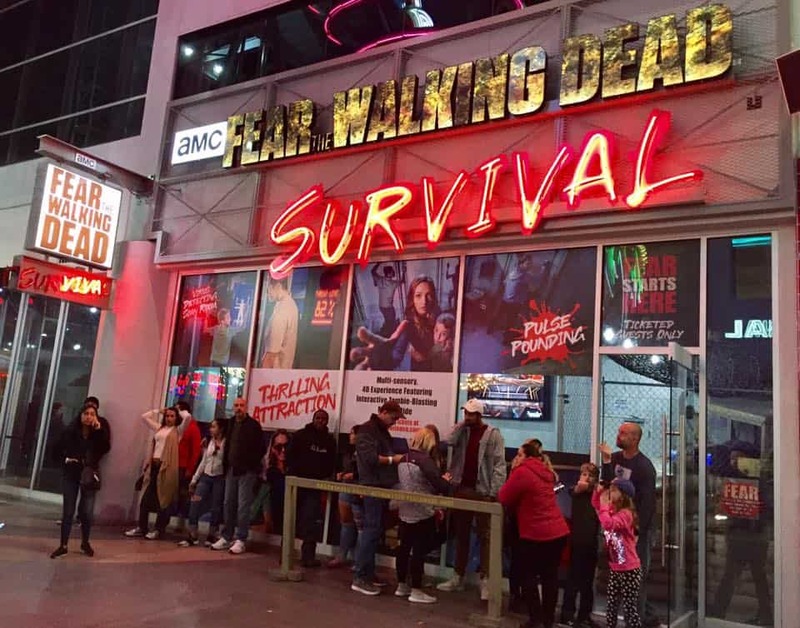 Have the scariest time of your life at the Fear The Walking Dead on Downtown Las Vegas’s Fremont Street. Based on the popular TV show, this is an escape room with a difference. Bodies in the beds, eerie green lighting and a hundred places where one of the undead can hide. Try and escape the maze of a makeshift military medical facility as the zombie hordes gather. Elaborate technology and great audio make this an unforgettable experience. Be prepared to scream. These zombies are real. 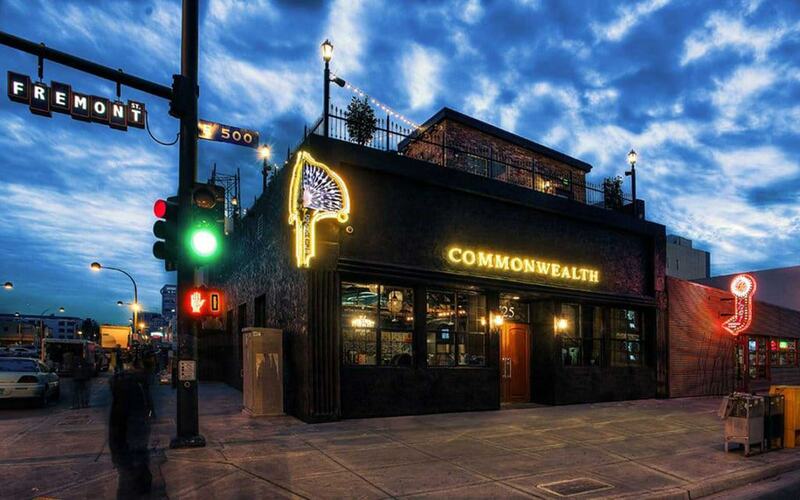 The Commonwealth is a classy bar on Fremont Street with décor inspired by the era of prohibition. Step inside and step back in time. The interior is dark, furnished with leather-topped stools and extravagant chandeliers. Behind the bar, a framed print of Burlesque girls adorns the walls above the extensive collection of whiskey bottles. The speakeasy-style bar has a rooftop terrace with sofa seating which is the perfect spot to sip a cocktail at dusk and watch the neon lights of Fremont Street come to life. There’s one thing which Downtown Las Vegas has in abundance, and that’s neon signs. It doesn’t matter where you look; you’ll see flashing lights. Where do neon signs go when they’ve run out of glow? 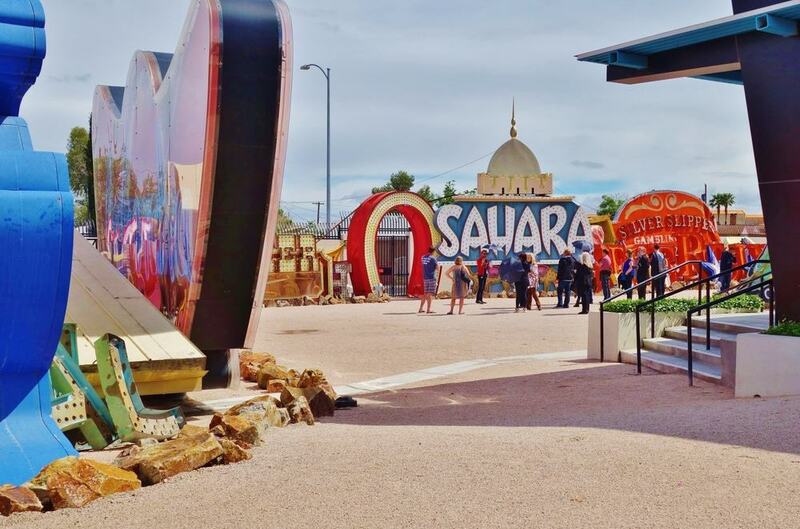 The graveyard for rejected and replaced signage – the Neon Museum of course. Tour the outdoor exhibits in the Neon Boneyard or the North Gallery. There are signs there dating from the 1930’s. One of the most surprising things about them is their colossal size. There are some great stories attached to individual pieces too, and you’ll find out which building they were erected on and what inspired the designs. It’s all part of DTLV’s colorful history. A visit to the Neon Museum is truly illuminating. Downtown Summerlin in Downtown Las Vegas is an open-air shopping mall which is crammed full of retail outlets, boutiques, restaurants, and bars. You could find it all under one roof here – if the mall had one that is. Browse the stores for fashion and accessory bargains. It could take a while as there are one hundred and twenty-five shops to choose from. Grab a quick lunch at the Crazy Pita or drop into Five Guys for a burger. Have dinner at the Mexican El Casa Del Matador or make a night of it at Dave and Busters a restaurant and entertainment venue with virtual games and old-fashioned classic pub-style shuffleboards. Tucked away at the back of the historic Four Queens Hotel and Casino which has been operating on Fremont Street in DTLV since the 60’s, is a cool club with live shows. 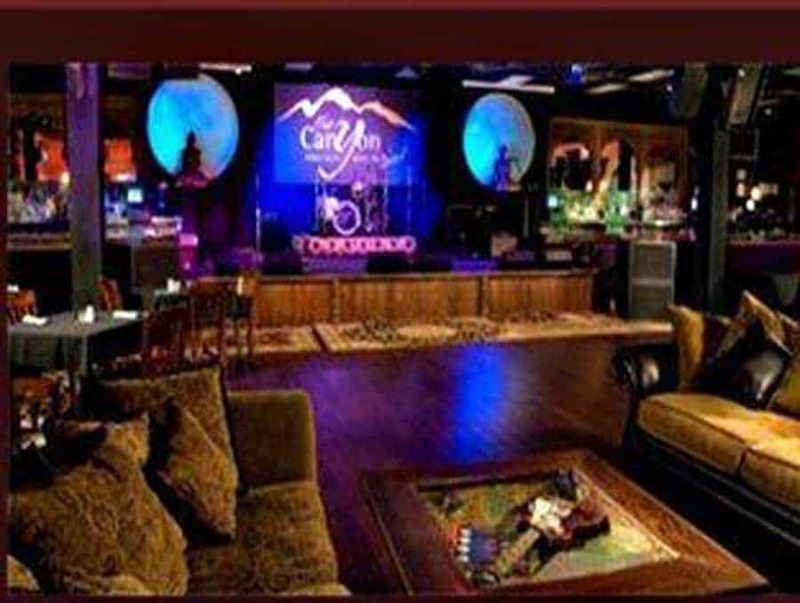 Sit in the plush surroundings of The Canyon Club and be impressed by a comedic mind reader who performs magic tricks or catch the Spirit of the King Show an Elvis Presley themed performance by a top class impersonator. Everyone who visits Downtown Las Vegas has to see at least one Elvis show. Make it the best one. 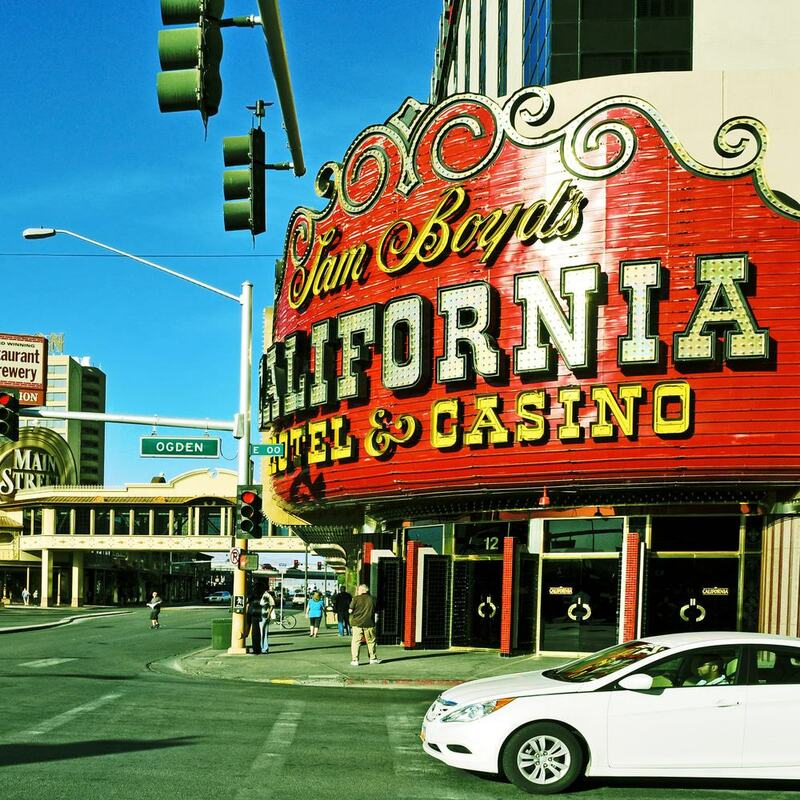 There are several good reasons to drop in at the long-established California Hotel and Casino, or the Cal as it is more commonly known, on DTLV’s Fremont Street. If you’re planning on trying your luck on the gaming tables or slot machines, pass by the Cal’s lobby area first. Inside you’ll find a wooden statue of the Happy Buddha. Rubbing his belly is reputed to bring good luck. All-nighters take a lot of energy. Replenish yours with a bowl of the Market Cafe’s infamous oxtail soup. The cafe, which is on the hotel premises, is open twenty-four hours a day. They don’t start serving their nourishing broth until eleven in the evening and are still ladling it into bowls at nine in the morning. If you think you’ve seen all the flashing neon that Downtown Vegas has, believe it, until you’ve seen the Viva Vision Light Show, you haven’t. The light show takes place on Fremont Street every night though start times do vary depending on the season. Look up, and you’ll discover, Fremont’s canopy ceiling is a video screen. The free display is choreographed to music from top rock and pop bands and is completely mesmerizing. The Viva Vision Light Show literally brings the street to a standstill. 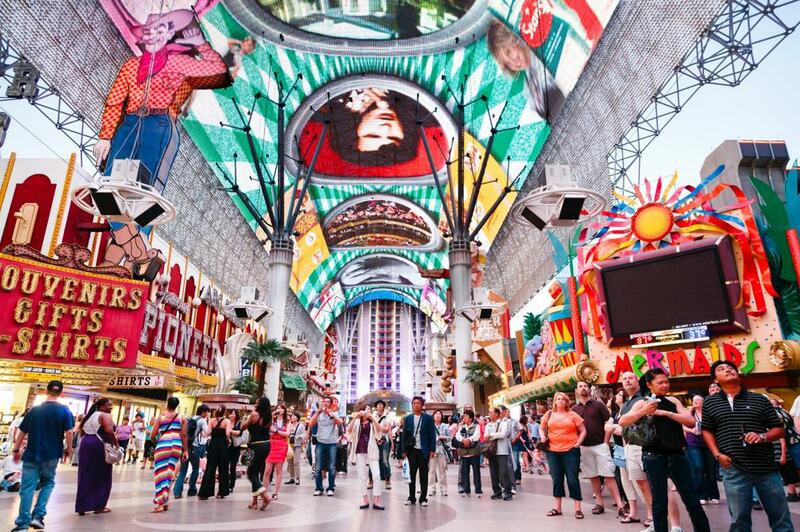 It’s mind-blowing, but then, that’s Downtown Las Vegas for you.